This Craftsman styled ranch house plan includes many luxurious details in a small package at just under 50 feet wide. The dining room with elegant coffered ceiling is open to the great room and convenient to the spacious kitchen. A thoughtful pass-through from the kitchen to the great room emphasizes the open floor plan and ensures flow from room to room. An e-space in the breakfast room offers a place to do homework, look up recipes or charge gadgets. At the entrance from the garage is the mudroom and a utility room with a handy closet. The master bedroom is topped with a tray ceiling and includes unique attributes such as a pass-through from one of the walk-in closets to the utility room and access to the screened porch. 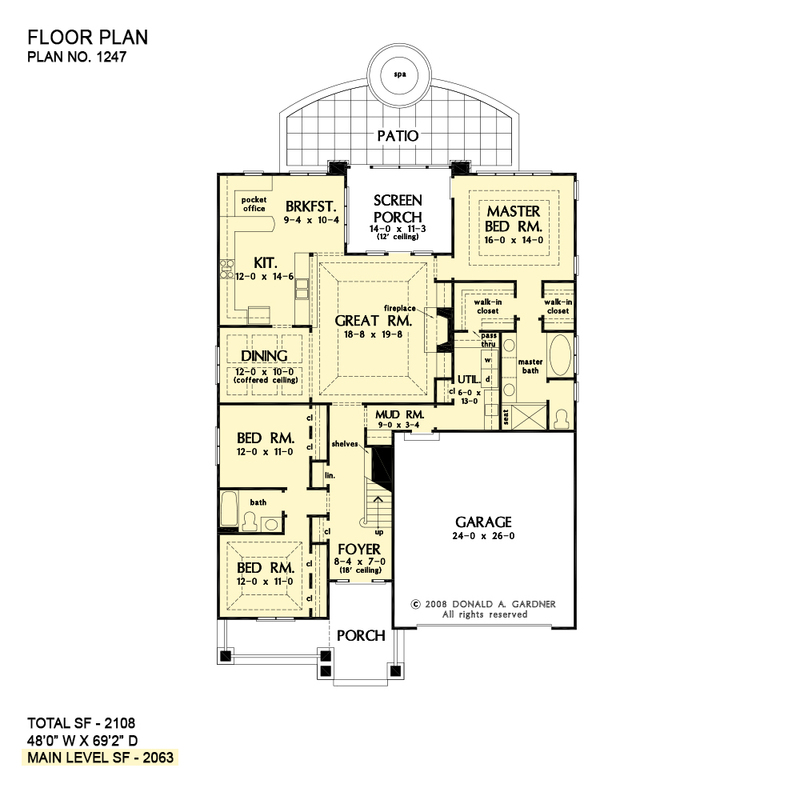 Upstairs is an enormous multi-level bonus space of nearly 800 square feet for expansion in this house plan. 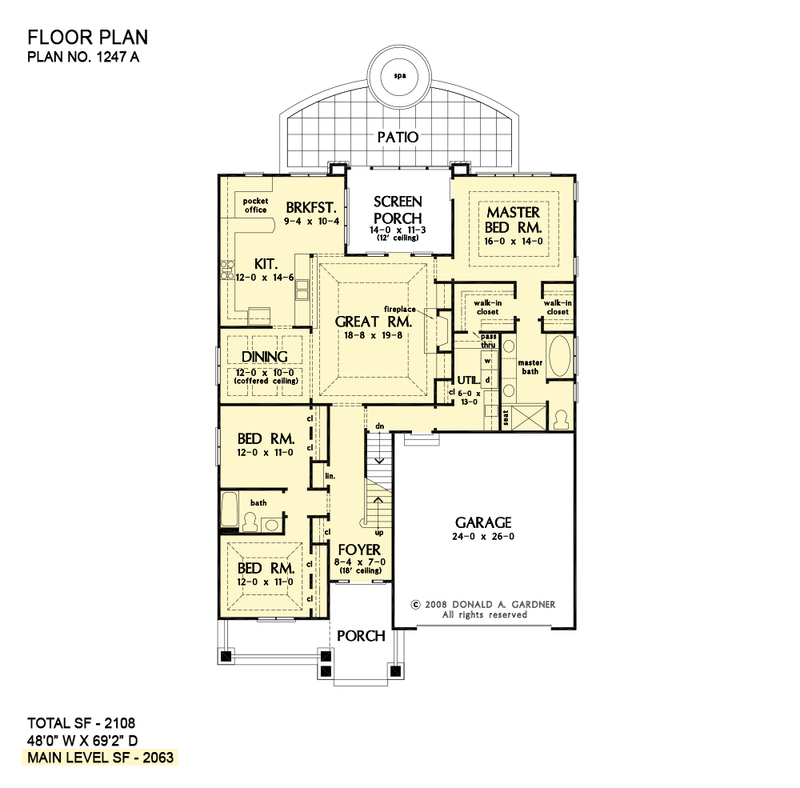 1st Floor: 2108 Sq. Ft. 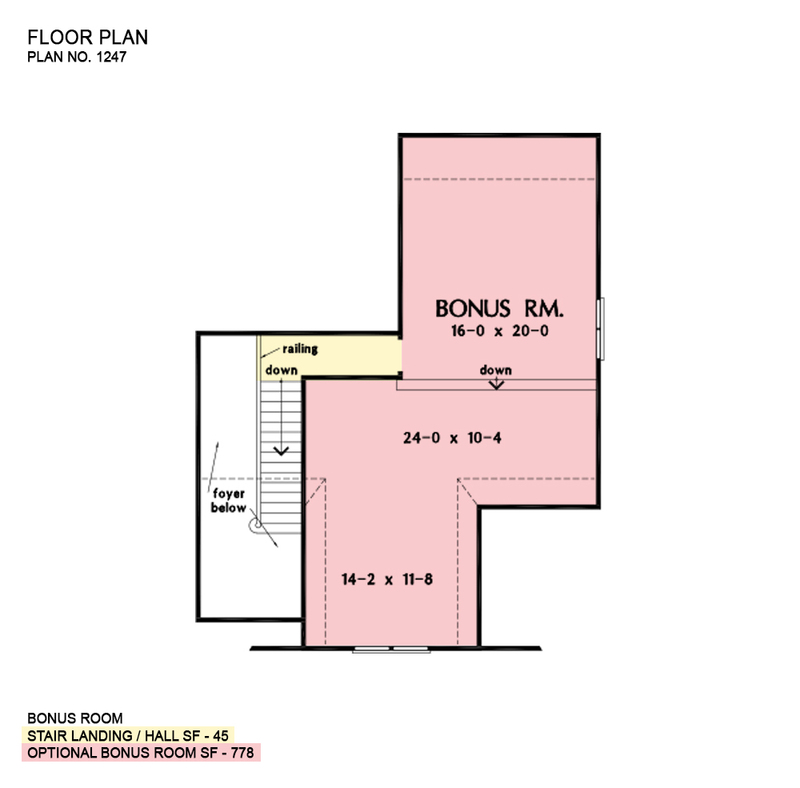 Bonus Room: 778 Sq. Ft.
House Dimensions: 48' 0" x 69' 2"
Great Room: 18' 8" x 19' 8"
Bedroom #2 : 12' 0" x 11' 0" x 9' 0"
Bedroom #3 (Tray): 12' 0" x 11' 10" x 11' 0"
Bonus Room : 24' 0" x 10' 4" x 9' 0"
Breakfast Room : 9' 4" x 10' 4" x 9' 0"
Dining Room (Coffered): 12' 0" x 10' 0" x 9' 8"
Pocket Office : 7' 0" x 5' 6" x 9' 0"
Foyer (2 Story): 8' 4" x 7' 0" x 18' 2"
Garage : 24' 0" x 26' 0" x 0' 0"
Great Room (Tray): 18' 8" x 19' 8" x 14' 6"
Kitchen : 12' 0" x 14' 6" x 9' 0"
Master Bedroom (Tray): 16' 0" x 14' 0" x 10' 5"
Mud Room : 9' 0" x 3' 4" x 9' 0"
Patio - Rear : 32' 0" x 12' 8" x 0' 0"
Porch - Front : 25' 0" x 6' 0" x 10' 0"
Porch - Screen : 14' 0" x 11' 1" x 12' 0"
Utility Room : 6' 0" x 13' 0" x 9' 0"